Enter this elegant vintage Belgravia-rehabbed home on a secure elevator that opens directly into your private foyer. This beautiful, freshly painted three bedroom, 2 1/2 bath stunner boasts gorgeous hardwood flooring throughout. The "L" shaped chef&apos;s kitchen comes complete with Wolf range, 2nd Dacor oven, Sub Zero fridge and granite countertops with full stone backsplash. A wet bar with wine fridge opens to the dining room. Spacious living area with sunny south and west exposure. Generous dining area fits most tables and has 2 niches for extra storage/display. Beautiful crown moldings and millwork, high ceilings. The large master bedroom has a WIC and en suite marble bath with double sinks, separate shower and soaking tub. Full size LG washer/dryer in kitchen. Organized cabinets and closets. Outdoor grilling area in the rear of building. Off site heated garage space at 2431 N Clark St is additional. Pet friendly. 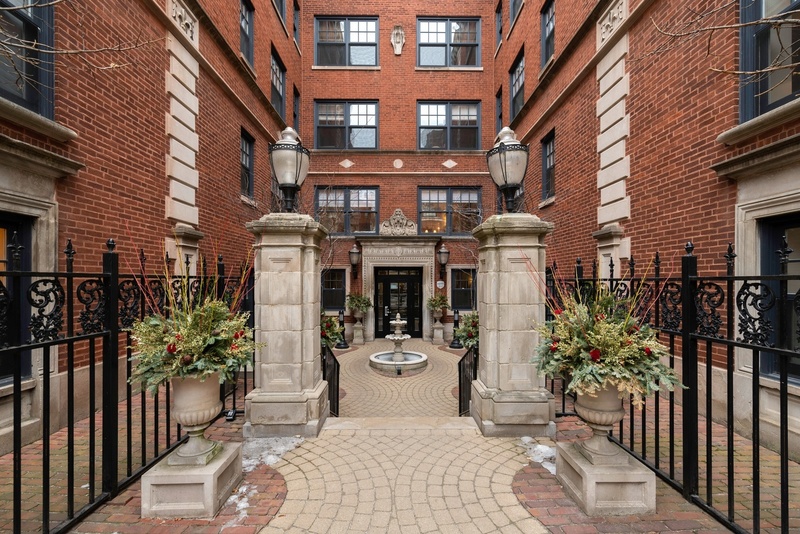 Steps from Lincoln Park, public transportation and the lakefront.